The beautiful St. Johns River at your doorstep. Fully furnished condo. 2 Bedroom 2 Bath unit sleeps 5 with all the comforts of home. Lanai with up close spectacular view of the St. Johns River. Pool area is complete with a cabana and small bar and outdoor grills. The pool is maintained year round and the grounds of the complex are kept immaculate. Free parking for two vehicles and boat slip is included which can dock up to a 27 foot boat comfortably. The Welaka area has multiple restaurants and watering holes, and is known as the bass fishing capital of Florida. The town is also known as a golf cart community, and its quiet private nature leads to a very relaxing and enjoyable stay. All the food and supplies you need to shop for are within a 15 min drive. 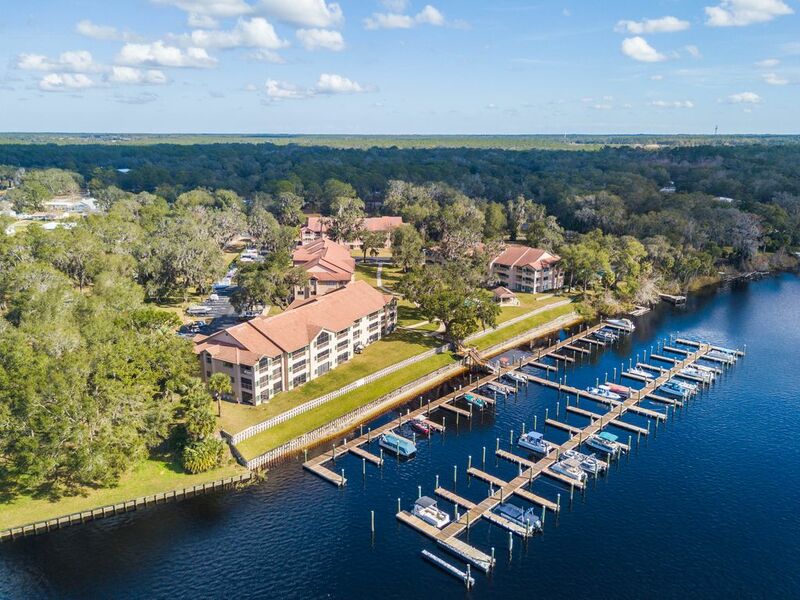 Whether you are planning to fish, boat at one of the two natural springs nearby, cruise over to nearby Crescent Lake, or just relax in the peace of the old south, you will totally enjoy your stay in this beautiful location. There is even a public tennis court, State Park, and a golf course all nearby for your entertainment. Very nice unit located on the ground floor. Parking for our car and boat trailer was convenient and the boat slip was great. Newer appliances were recently installed and a new air conditioning unit was also there. Everything was there that could be needed making our stay as homelike as possible. Thanks for the review Roberta! I would love to have you come back! I offer returning guests a 10% discount. We stayed for 22 days. Great location with awesome views. Walk out to the dock for easy access to our boat. Refrigerator broke, was replaced immediately. Recommended to stay. Only issues were roof replacement was going on the whole time we were there with parking issues and water main break. Neither should be concerns going forward. I would love to have you come back! I offer returning guests a 10% discount if they book within 6 months of their departure date.